It was great that my editor at the i newspaper remembered my Croydon connection and asked me to cover the National Trust’s Croydon Edge City walking tours of Croydon. Check out my take on them below in full or the original here. There isn’t a cream tea in sight on the National Trust’s new Edge City walking tour of Croydon’s architectural highlights. Croydon is a borough the size of Cardiff on the edge of South London that refuses to know its place. It has been ridiculed for its claim to have a mini-Manhattan skyline and its repeated applications for city status. However, it’s news to me that Croydon has any architectural highlights at all – and I was born and grew up here. After all, its 1960s redevelopment has given us the term “Croydonisation” – the Oxford English Dictionary defines it as the architectural ruining of a town centre. Now the National Trust is trying to convince me that I’m wrong. We stop by the Whitgift Centre, which was one of Britain’s largest shopping centres when it covered the town in 11 acres of concrete in the 1960s. It’s still in the top 20. The architectural historian Nikolaus Pevsner described its architecture as banal, but as functioning unusually well. It is due to be transformed and enlarged by Westfield-Hammerson. High above us I catch a glimpse of the huge grey slab-like Lunar House, which used to sum up for me everything I hated about Croydon. Yet in the summer sun its sheer in-your-face brutalism, with its white precast concrete space-age wings on top, has a surprising beauty. Edge City: Croydon is a week-long series of walking tours and events, which run until 24 July, that are run by the National Trust that explores Croydon’s importance as an example of post-war development. It follows the Trust’s Brutal Utopias project in 2015 that celebrated brutalist architecture in London, Sheffield and Norwich. Today Croydon is 20 minutes by train from central London. It sits at the heart of the London Borough of Croydon, which was only formed in 1965. Its population is about 375,000; mirroring that of central London in its diversity, it is predicted to grow to 500,000 over the next few decades. And yet there are many Croydons. The 21st-century Croydon is the £500m high-end Ruskin Square development on East Croydon station’s derelict goods yard and the Boxpark pop-up mall next door built from 80 shipping containers. There is also the alternative tech-city Croydon, made by entrepreneurs looking to escape the expensive rents of London’s Silicon Roundabout. Its spiritual home is Matthews Yard in the narrow streets of Old Croydon. What had attracted my parents was suburban Croydon: the dream of affordable Edwardian villas, leafy streets and good schools. What they found instead was the rapid and large-scale development of the town centre to rival that of central London. I grew up with bedtime stories of a lost “golden age” of Croydon, when schoolboys in whites played cricket where the Whitgift Centre now stands. By the time I left Croydon in the mid-1990s I was ready to agree with David Bowie when he said that Croydon represented everything he hated. Dominating the town are the clear vertical lines of the 23-storey concrete St George’s House that most people call the Nestlé building. The planner had apparently asked for a really tall building and that’s what he got. At its opening Croydon’s mayor remarked that Nestlé could be excused for thinking it owned Croydon. It is empty now, awaiting conversion into flats. Then there is the mini-Manhattan set-piece view. It stretches from what was Croydon’s tallest building, past the Whitgift Centre and down to Croydon’s tallest building. It isn’t a breathtaking moment like looking back at Manhattan from the Staten Island Ferry, but it speaks of the power, ambition and drive of the city planners to clear so much space. “We absolutely love it,” Joseph Watson, London creative director of the National Trust, says when I catch up with him. “It is iconic of a particular post-war moment. By creating these extraordinary sculptural blocks it demonstrates what capitalism can do. Look back along Wellesley Road from the Fairfield Halls and you have that set-piece mini-Manhattan moment. Fifty years ago there was no other landscape like that in the country. “The National Trust coming to a town like Croydon is the last thing you expect to happen,” says John Grindrod, a Croydonian who wrote Concretopia: A Journey Around the Rebuilding of Post-War Britain. “I was worried they were doing it for shock value, but it feels very sincere. It is easy to take the mickey out of Croydon. The last stop of the tour was the top floor of the nearly empty and nondescript AMP House. Rather ironically it is used as a marketing suite for Ruskin Square. From up there I saw the whole of Croydon for the first time. In the distance were the tower blocks of central London. 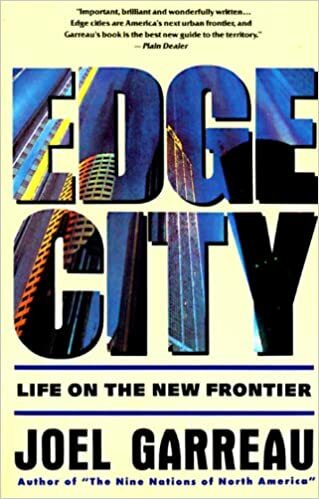 According to Garreau, edge cities can be defined by their sense of ambition. I see things differently now.